Pawn Stars Season 1 Episode: 4 - Knights in Fake Armor? 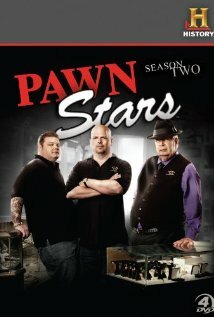 Pawn Stars Season 3 Episode: 5 - Aw Shucks! Pawn Stars Season 4 Episode: 12 - Ah, Shoot! Pawn Stars Season 6 Episode: 1 - What You Talkin' 'Bout Sturgis? Pawn Stars Season 6 Episode: 12 - Wouldn't It Be Ice? Pawn Stars Season 8 Episode: 26 - Whodunit? Pawn Stars Season 8 Episode: 69 - Who's Your Dali?